SPRI Coast to Coast. SPRI Coast to Coast is the site that brings under one roof the many institutes that seek God, and the unseen in a systematic physics based research atmosphere. SPRI Spiritual Physics Recognition Institute: Spirit, memory, life, family, fact. SPRI Spiritual Physics Recognition Institute seeking answers of the unseen spiritual world above and around us through physics research. 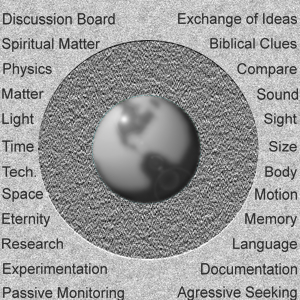 SPRI investigates the conversion from physical to spiritual and presents a question of physics. Time engages all things, but what is it? Or is there simply existence that never ends but only changes. Are all things the first creation or residue of time itself or residue of sound created of the weight and gravity of sound itself in a void ... or voice itself of God that begins it and then forever? In the "beginning" there was the "word", and the word WAS God.